Where’s this guy been? He’s been taking a month off, is the answer, choosing to suffer the ignominy of a nasty dried pea on the Bean Counter for the sake of enjoying a month free of the obligations of blogging and commenting. Those arduous tasks take their toll on a man, even one as handsome as me, and a few weeks away from it make all the difference. I’m back now, fully recharged and ready to write more glittering blog jewels. 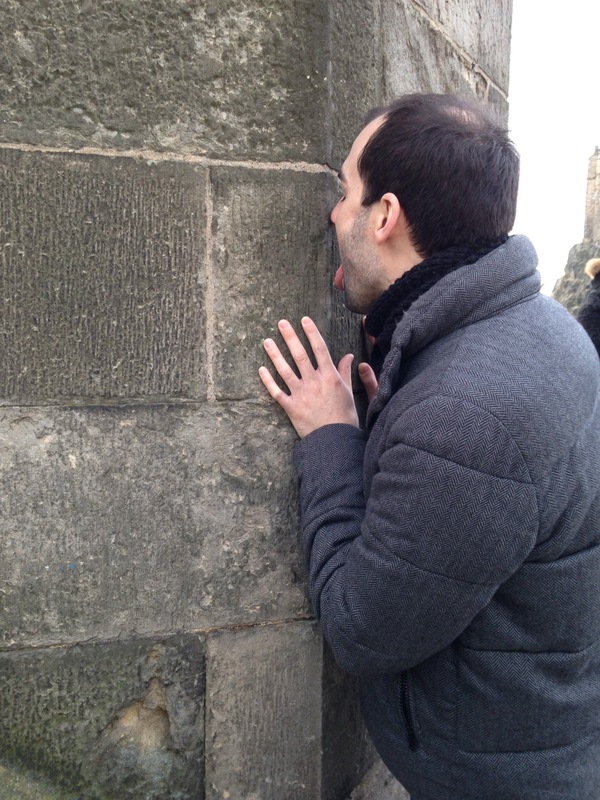 If you want a more literal answer to the question “where’s this guy been?”, then the answer is Edinburgh. Edinburgh is a city in Scotland, famous for the coldness of the weather, the vivid orange of the Irn Bru, the fakeness of the tartan sold in tourist shops and the whisky. The other thing it’s famous for is its castle, an amazing fortress sitting high atop a rocky mountain in the centre of the city, and though few believed me when I told them, it is made entirely of whisky. What did the pea taste like though? How’d you like that, boy? Did you lick the whole castle or just that one block? If not, how can you be so sure it is entirely made of whiskey and that some Scottish bloke hadn’t previously been sick on the block you licked impregnating it with a permanent whiskey flavour. I took a random sampling of blocks as I travelled around the castle and its environs. All tasted of whisky to some extent, though obviously I can’t entirely rule out the possibility that all of them have been vomited upon at various points in the castle’s history. With reference to Ian’s question, I don’t like that boy. I once vomited up an entire castle. It didn’t taste of Irn Bru but it did slightly resemble Alfred Hitchcock if you tilted your head and squinted. No you didn’t. I’d remember that. Okay, well I once vomited up an entire bungalow. It didn’t taste of Irn Bru but it did slightly resemble Moira Stewart if you tilted your head and squinted. I don’t think you did that, either. If you had you’d have tossed off another of your appalling books about it by now, probably called something like “Chucking Bungalows: The Part-Digested Dewlling Within Me (Not You)”. Do things often dewll in you? I’d see a doctor just in case, sounds painful. Okay, well I once vomited up an entire conservatory. It didn’t taste of Irn Bru but it did slightly resemble Dave Benson Phillips if you tilted your head and squinted. He did do that, I saw it afterwards. It was in a right state, to my mind it looked more like Ainsley Harriott though. I knew I threw up something and I knew it resembled someone. My memory is not what it once was. Look at me! OK, yeah, that did happen. I know because it was mentioned in the Skyrack Express. You mean the Leeds Skyrack Express? Does that still exist anymore, is that a thing? I don’t think it’s a thing. Not that I live there anymore and can verify this. If only we knew someone in the area. Yes, that one. I’m not sure it’s still a thing. But back when you honked up a conservatory, it definitely was. That’s a very good point. In fact, if I can, owl dig up the original headline. It was mostly me looking sheepish. If you can owl be delighted to see it. I remember when I saw the original when it was first in the paper, but then I had to use it to block up an old pipe that was seeping brown liquid into the loft and now it’s unreadable, largely due to decomposition. Does my face look better in brown liquid? I think it would. I was on the cover of Green Liquid Monthly in November of last year and I looked amazing.